This is the first year that my oldest could write a letter to Santa. Writing letters to Santa has been a tradition in my family since my husband and I first got together. It was a way to let each other know what we would like and still keep the fun of Christmas! And now my son is in on the action, too. 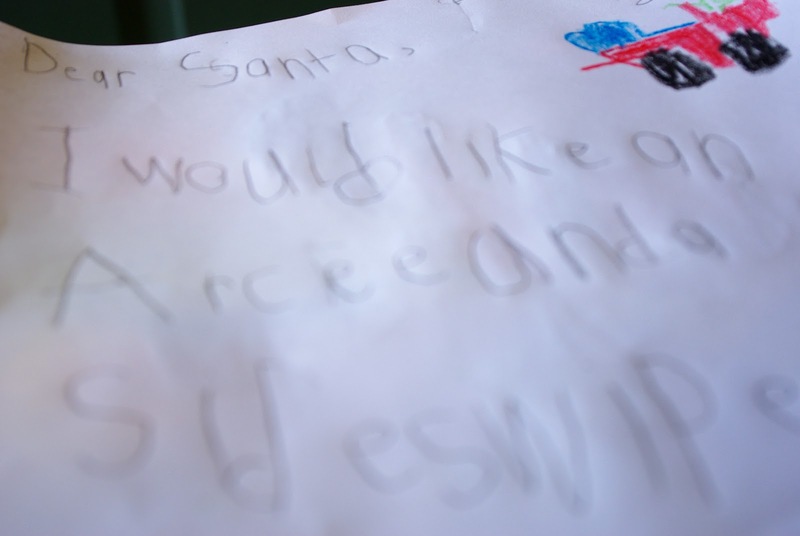 My son's letter has reminded me of an important lesson about Christmas. For at least a month my husband and I have been determining what gifts to get our children. We usually try to get one "large" gift and a couple of small. We had all sorts of grandiose ideas for our oldest to include one of those hand-held educational tablets. But then I read my son's letter. He didn't want any whizzbang stuff. He asked for three simple toys. And on top of that he wanted to include some things for his Angel from the Salvation Army tree. The moral of the story? Christmas gets out of hand quickly because we as parents let it do so. If my son is given tons of pricey gifts now, he will grow to expect that. But if we focus on a few items he would really love we can make the holiday more about giving and less about getting. Read my 2011 Advent Calendar of Christmas Memories - Santa Claus here. The Advent Calendar of Christmas Memories (ACCM) allows you to share your family’s holiday history 24 different ways during 24 days in December! Learn more here.